Introduction: One of the most familiar stories in the Bible is found in Daniel 6 which picks up where Da 5:31-note left off with Darius the Mede beginning his reign. 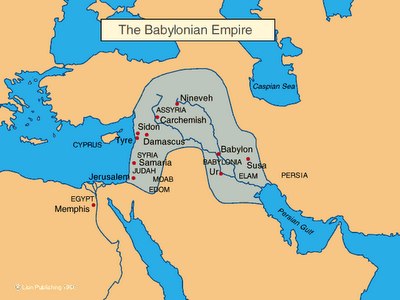 Just as God had predicted through the dream He gave Nebuchadnezzar, the head of gold, Babylon, was removed and the body and arms of silver, the Medo-Persians, now have been established as the dominant world empire (Da 2:21-note, Da 2:32-note, Da 2:39-note) Judah has been in exile 70 years in Babylon (Da 9:2-note). Daniel is an old man in his 80's (Chronological Structure of Daniel). This chapter marks the end of the "historical" (or narrative) section of Daniel and prepares us for the great prophecies in Daniel 7-12, prophecies that form the "back bone" or foundation for all other Biblical prophecies dealing with the last days that precede and terminate in the Second Coming of the Messiah. I have aroused him (King Cyrus) in righteousness and I will make all his ways smooth; He will build My city (Jerusalem) and will let My exiles go free (after 70 years of Babylonian captivity), without any payment or reward,” says the Lord of hosts. (Is 45:13). Archaeology has substantiated the Biblical record (as if the Word of Truth needed any validation!) with the discovery of the famous Cyrus cylinder written in 538BC. On this cuneiform cylinder Cyrus recorded his capture of Babylon and his program of repatriating the conquered peoples to their homelands writing..
From [Babylon] to Aššur and (from) Susa, Agade, Ešnunna, Zamban, Me-Turnu, Der, as far as the region of Gutium, the sacred centers on the other side of the Tigris, whose sanctuaries had been abandoned for a long time, I returned the images of the gods (See Cyrus' words in Ezra 6:5 - "utensils of the temple of God"), who had resided there [in Babylon], to their places [including Jerusalem] and I let them dwell in eternal abodes. I gathered all their inhabitants and returned to them their dwellings. Daniel 6:1-28 are numbered Da 6:2-29 in the Aramaic text. Warren Wiersbe entitles this chapter "Liars, Laws, and Lions"
Daniel 6 instructs us about remaining faithful when the pressure is on. Favored, Framed, Faithful, Fed, Freed! Darius - Who is this Darius? Darius the Mede ruled from 539-525BC and thus overlapped with the rule of Cyrus (539-530BC). Although it is by no means a consensus, many scholars identify Darius the Mede Gubaru, a general in Cyrus' army who led the forces into Babylon. Note in the table below Darius the Mede is not to be confused with Darius I (the Great). The prophet Daniel worked for the government for many years. If all those who worked for the government or for business had these qualities, the world would be a better place in which to live. He had an "excellent spirit". He was faithful. There was no accusation possible against the man, unless he was accused about his God. His enemies plotted to undermine him by putting him in a position of possible compromise concerning his God. Daniel continued to worship his God in spite of the threat of persecution. He continued to do what was right! After being falsely accused and spending the night in the lion's den, Daniel still had a clean conscience. He could honestly say, "Oh King I have done no hurt." He had believed in his God and stood firm for Him. How does Daniel 6:1, 28 to Da 2:32, 38, 39? Fulfillment of prophecy of gold giving way to silver, which he said would be inferior. How old was Daniel? 70 years plus his age when taken captive in 605BC - At least 80yo or older. How does Daniel's life example relate to Heb 12:1? He is still running with perseverance the race which God set before him, leaving an example for all believers of every age to imitate (Heb 6:11, 12). So many begin well but finish poorly. Why are we surprised that Daniel was one of three commissioners? He had been the third ruler in Babylon and the second ruler Belshazzar had been slain (Da 5:30). Why not Daniel? As noted below God's man is immortal until God's purpose for his life is accomplished! Daniel 6:2 and over them three commissioners (of whom Daniel was one), that these satraps might be accountable to them, and that the king might not suffer loss. Of whom Daniel was one (KJV rendering gives a slightly different sense - "of whom Daniel was first") - Daniel presumably was in the party room the night of the overthrow of Babylon and had been given a purple robe and a gold necklace which would cause him to stand out as royalty, not to mention that he was now the third ruler in Babylon! And yet Daniel survived. God's man is immortal until God has fulfilled His purposes in and through that man. God never leaves Himself without a witness, whether in positions of power or in the lower echelons of society. Wiersbe - Today, wherever you find dedicated believers living and working with unbelievers, you will often see the same forces at work that are described in this chapter, whether in families, churches, corporations, or governments. It’s certainly a commendable thing when people possess character so impeccable that they can’t be accused of doing wrong except in matters relating to their faith. (Wiersbe, Warren: Be Resolute (Daniel)- Determining to Go God's Direction). Daniel 6:3 Then this Daniel began distinguishing himself among the commissioners and satraps because he possessed an extraordinary spirit, and the king planned to appoint him over the entire kingdom. Distinguishing (05330)(nesah) is an Aramaic verb meaning to exhibit or show a difference. The Hithpaal force is brought out in a reflexive usage (distinguishing himself). When one is distinguished he is identified as different and distinct. This is the only use in the Scriptures. Webster's 1828 says distinguish means "to ascertain and indicate difference by some external mark. The farmer distinguishes sheep by their ears. To separate one thing from another by some mark or quality." Daniel was separated from the other commissioners and satraps by his excellent spirit. Extraordinary (03493) (yattir) is an Aramaic adjective designating something as excellent, outstanding. superior. In Nebuchadnezzar's dream in Da 2:31 the statute was described as "large and of extraordinary (yattir) splendor." The Septuagint (Lxx) translates excellent in Da 6:3 with the adjective perissos which speaks of that which exceeds the usual expectation and thus is extraordinary or remarkable (Jesus used perissos in John 10:10 to describe His desire that we might have "life and have it abundantly (perissos)". Reputation is what men think you are, while character is what God knows you are. Daniel was both. He was not a hypocritical "OT Pharisee". Daniel knew the truth that what a man is in the sight of God (Pr 15:3), is what a man truly is! Integrity (from "integer" = the whole of anything, a whole number not a fraction - think "whole character" not a fraction of one!) speaks of the unimpaired state of one's mind and heart, of moral soundness and purity, of incorruptness, of uprightness, of honesty. Just as we would talk about a whole number, so also we can talk about a whole person who is undivided. A person of integrity is living rightly, not divided, nor being a different person in different circumstances. A person of integrity is the same person in private that he or she is in public. Integrity has the same root word as does the word integrated. A leader of integrity has taken the principles that govern his life, internalized them, and integrated them into every area of his life. Integrity is not like a weathervane that changes direction with every shift of the social winds, as Daniel will soon dramatically demonstrate. See also - Ge 16:13 Dt 11:12 21:9 2Chr 6:20 Ps 33:18 Ps 34:15, Ps 113:6, Ps 139:2,3, Job 34:21, 31:4, Pr 5:21 Jer 16:17, 23:24, 32:19 Zech 4:10 Heb 4:13 1Pe 3:12 Ge 6:8. A simple definition of integrity is doing what you say you will do. Does this describe me? 1828 Webster's - Integrity comprehends the whole moral character, but has a special reference to uprightness in mutual dealings, transfers of property, and agencies for others. (How's your "integrity quotient"?) Integrity is an unimpaired condition or soundness, adherence to a code of moral values, and the quality or state of being complete and undivided. See also honesty. Integrity means soundness, completeness, honesty. Integrity (from the Latin word integer, “entire”) may be defined as the condition or quality of being undivided. It describes those who adhere to their ethical or moral standards without hypocrisy or duplicity. People with integrity lead lives that are one with their stated convictions; they what they preach.” They are honest, sincere, and incorruptible. In biblical terms, those with integrity are “above reproach”—a quality that is to characterize all believers (Php 2:15-note; 1Ti 5:7), but especially elders (1Ti 3:2; Titus 1:6, 7-note). The upright man leaves his heirs his example, and this in itself will be a mine of true wealth. How many me may trace their success in life to the example of their parents! He leaves them also his repute. Men think all the better of us as the sons of a man who could be trusted, the successors of a tradesman of excellent repute. Oh, that all young men were anxious to keep up the family name! Above all, he leaves his children his prayers and the blessing of a prayer-hearing God, and these make our offspring to be favored among the sons of men. God will save them even after we are dead. Oh, that they might be saved at once! Chuck Colson exaggeratedly (albeit rightly) said "The three most important ingredients in Christian work are integrity, integrity, integrity." It’s a fact of life that you never know when your integrity will be tested. But is is also true that integrity shines brightest against the backdrop of adversity. People may doubt what you say, but they will always believe what you do. Satan does not need to accomplish much to destroy integrity. Because integrity has to do with wholeness, even a small chink destroys it. Integrity is a true 24/7 concept. Consistently right choices create (or reveal) integrity. One evil choice creates a fault line of potential catastrophe. A person of integrity is unimpeachable. He or she stands by principles no matter what the consequences. In fact integrity can cost you a relationship, reputation, promotion, job, even your life. Do you speak the truth (Biblical truth in love) no matter what people want to hear? That's integrity. Do you have singleness of heart, of mind, of vision, of purpose? That's integrity. Paul said it this way "one thing I do: forgetting what lies behind and reaching forward to what lies ahead, 14 I press on toward the goal for the prize of the upward call of God in Christ Jesus. (Php 3:13,14) Integrity manifest a single heart, a single mind, a single eye, a single focus - ONE THING - Integrity presses on toward the goal! People of biblical integrity tend also to be people with unashamed boldness. 1Chr 12:33 describes men "with an undivided heart" where undivided heart in Hebrew literally = they were without a heart and a heart! That's Biblical integrity! Integrity practices what it preaches! If your enemies were out to get you, and did an audit of your lifestyle, could they find room to criticize you? Daniel’s life of utmost integrity was such that his enemies could find nothing with which to accuse and besmirch him! Why did Daniel's enemies know he would defy the King’s law in Daniel 6:10ff? Because Daniel was a man of integrity—he was consistent -- He did not pray to show his integrity, he prayed because of his integrity. If you had to write your epitaph, what would you say? In fact you are "writing your epitaph" today with the choices you make and by the way you live out those choices. Your friends and family will remember you for something, what will it be? May our earnest desire be that when we are laid to rest our life will have earned the epitaph—He/she was a man/a woman of Integrity. True be told, when it is all said and done, integrity is all that really counts. The Bible teaches that a believer's integrity is never for sale and never to be sacrificed. Horace Greeley - Fame is a vapor, popularity an accident, riches take wings, those who cheer today may curse tomorrow, only one thing endures—character. A clear conscience is a prime benefit of integrity, and it enables one to stand firm when the storms of life come upon us. If your heart does not condemn you, but affirms you, you can be a tower of strength for "The man of integrity walks securely" (Pr 10:9) where the Hebrew for "securely" means safety, security, place of refuge; feeling of trust, assurance, without concern, confidence. A person of integrity will have a good reputation and not have to fear that he or she will be exposed or found out. Integrity provides a safe path through life. Lose all rather than lose your integrity, and when all else is gone, still hold fast a clear conscience as the rarest jewel which can adorn the bosom of a mortal… Serve God with integrity, and if you achieve no success, at least no sin will lie upon your conscience. Spurgeon - Morning and Evening. There is an evangelistic magnetism in integrity (Think of the effect of Daniel on the lives of King Nebuchadnezzar and King Darius) Every day we rub shoulders with people who are watching. Here in Daniel 6 we see that some are watching who the become jealous, but others are attracted to what they observe. When Christ is our life and He is living through us (think of integer = one - Christ is in us, we are in Covenant with Him, we are "one" with Him, and when we walk in integrity, that "oneness" with Christ becomes obvious to others! ), we become an aroma of life to some but an aroma of death to others (see 2Cor 2:14, 15, 16). The integrity of a believer's life will demonstrate to the lost world whether Christianity is true or false. They make value judgments about us by our attitudes and actions. Have we made the right choices? Remember we may be the "only Bible" those around us will ever read! What is the "Gospel" according to __________ (your name here)? In other words, people around us often judge the truthfulness of Christianity by its affect in our lives. If they see Christians as duplicitous, as hypocrites, etc, they may not go any further in their investigation of the gospel. Jesus is the supreme model of integrity. His enemies, even in their flattery, could only declare, "Teacher, we know you are a man of integrity. You aren’t swayed by men, because you pay no attention to who they are; but you teach the way of God in accordance with the truth" (Mk 12:14). So one thing integrity means is that we speak the truth no matter what people want to hear. Christ is our ultimate model of integrity. He could declare "I and the Father are one" (John 10:30). His will was so integrated with the will of His Father that there was no division of mind or heart (think "integer") Believers have been redeemed and are in the oneness of the New Covenant relationship that we are also to be so integrated, to be conformed to the image of God in Christ. A few words describing the opposite of integrity beginning with "d" = devious, deceitful, dissembling, doubletalk, double-minded, duplicitous, dishonest, double-dealing, deceptive, delusive, defrauding! The opposite of integrity is corruption (Daniel was incorruptible). This person lives in contradiction; without an integrating core one’s conduct is marked by a host of "d" words! A few words that are synonymous with integrity = conscientious, honest, principled, true, honorable, noble, just, scrupulous, upright, blameless, aboveboard, forthright, straightforward, open, authentic, trustworthy, incorruptible, moral, upstanding, fair-minded. One tiny piece of dirt in the carburetor can prevent a powerful otherwise well tuned truck from successfully climbing a mountain. This is a rather small impurity but it is all-important in making the ascent. In the same way, one tiny lapse in our integrity can have a great impact on our spiritual trek. Daniel began distinguishing himself - Why? Because he possessed an extraordinary spirit. Do you your work with excellence as unto the Lord, as if He were the One "inspecting" your work? (see Col 3:17-note, Col 3:23, 24-note = How is this possible? We need to obey the command to let the Word of Christ dwell in us richly! Col 3:16-note, which relates to being filled with the Spirit, Eph 5:18-note, which relates to doing our doing our work heartily). Wiersbe comments: Integrity means that your life is whole, that your heart is not divided. Jesus said, "No one can serve two masters" (Mt. 6:24-note). That's integrity. Duplicity means trying to serve two masters. Our Lord also said that nobody can look in two directions at the same time. If your eye is single, then your body is full of light. But if your eye is double, watch out. The darkness is coming in (Mt. 6:22,23-note). If you look at the darkness and the light simultaneously, the darkness crowds out the light. (Warren Wiersbe. Prayer, Praise and Promises). Several OT characters are designated persons of integrity: Noah (Gen. 6:9); Abraham (Ge 17:1); Jacob (Ge 25:27); Job (Job 1:1, 8; 2:3); and David (1Kings 9:4). It is interesting that Jesus did not use the word "integrity" but he did use terms and phrases that are virtually synonymous when he called for purity of heart (Mt. 5:8), singleness of purpose (Mt. 6:22), and purity of motive (Mt. 6:1-6). Do you refuse to compromise with the enemy when you’re under stress? That's integrity. When you die and people file out of the church after your memorial service, will they comment, "He said what he meant and meant what he said"? Will they say, "You knew where he stood," or "You could trust him," or "You could count on him"? Will someone say, "He had integrity"? Ten elements that make up personal integrity—and the Bible personalities who exemplified them—are honesty (Daniel), compassion (Boaz), wisdom (Solomon), self-control (Timothy), joy (Paul), trust (Abraham), faithfulness (Caleb and Joshua), balance (Mary and Martha), sexual purity (Joseph), and endurance (Job). In his book I Surrender, Patrick Morley writes that the church’s integrity problem is in the misconception "that we can add Christ to our lives, but not subtract sin. It is a change in belief without a change in behavior." He goes on to say, "It is revival without reformation, without repentance." consists in drawing a line somewhere. Integrity leaves a legacy for one's children to follow in our steps. A righteous man who walks in his integrity-- How blessed are his sons after him. (Pr 20:7). Integrity Will be Tested - A pastor preached a sermon on honesty one Sunday. On Monday morning he took the bus to get to his office. He paid the fare, and the bus driver gave him back too much change. During the rest of the journey, the pastor was rationalizing how God had provided him with some extra money he needed for the week. But he just could not live with himself, and before he got off the bus he said to the driver, "You have made a mistake. You’ve given me too much change." And he proceeded to give him back the extra money. The driver smiled and said, "There was no mistake. I was at your church yesterday and heard you preach on honesty. So I decided to put you to a test this morning." Integrity - one's deeds match one's words! Dr W H Houghton, pastored the Calvary Baptist Church in NYC and later served as president of Moody Bible Institute. When Dr. Houghton became pastor of the Baptist Tabernacle in Atlanta, a man in that city hired a private detective to follow Dr. Houghton and report on his conduct. After a few weeks, the detective was able to report to the man that Dr. Houghton’s life matched his preaching. As a result of Houghton's faithful life, a life of integrity, that man became a Christian. It is easy to tell a lie but hard to tell only one. Discipline will help us avoid the guilt that we often experience by dabbling in things we shouldn’t. THE DAY AMERICA Told the Truth, a new book based on an extensive opinion survey which guaranteed the anonymity of the participants, reveals an alarming crisis of integrity in America. Only 13 percent of Americans see all Ten Commandments as binding on us today. Ninety-one percent lie regularly — at home and at work. In answer to the question, “Whom have you regularly lied to?” the statistics included 86 percent to parents and 75 percent to friends. A third of AIDS carriers admit to not having told their lovers. Most workers admit to goofing off for an average of seven hours — almost one whole day — a week, and half admit that they regularly call in sick when they are perfectly well… The truth is, American culture is in big trouble. The colossal slide of integrity (especially masculine ethics) has grim spiritual, domestic, and political implications which threaten the survival of life as we know it. • Falsify their income tax returns. • Commit plagiarism (teachers especially know this). • Illegally copy a computer program. • Tell people what they want to hear. • Selectively obey the laws. "Did you pay for it?" "No," she replied. "Did you work for it?" "No." "Did anyone give it to you as a gift?" "No." "Well, then, if you have not paid for it and if it was not a gift and if you have not worked for it and you took it, that is stealing. Now you go back into the lumberyard and return it." EYES OF INTEGRITY - When friends at the pool teasingly told my husband that a beautiful blond was coming his way, they were amazed that he didn’t turn to look. "Aren’t you going to look?" they asked him. Dan joked that his wife wouldn’t let him. "But it is your wife!" they laughed. Integrity of Hearts not Walls! - In ancient China, the people desired security from the barbaric hordes to the north. So they built the Great Wall of China. It was too high to climb over, too thick to break down, and too long to go around. Security achieved! The only problem was that during the first hundred years of the wall’s existence, China was invaded three times. Was the wall a failure? Not really—for not once did the barbaric hordes climb over the wall, break it down, or go around it. How then did they get into China? The answer lies in human nature. They simply bribed a gatekeeper and then marched right in through a gate. The fatal flaw in the Chinese defense was placing too much reliance on a wall and not putting enough effort into building character into the gatekeeper. to do a little thing well. "In order to understand integrity, we must first realize that two forces are at work in our world today: (1) God is putting things together; and (2) sin is tearing things apart. God wants to make us integers; Satan want to make us fractions… Integrity is to personal or corporate character what health is to the body or 20/20 vision is to the eyes. A person with integrity is not divided (that's duplicity) or merely pretending (that's hypocrisy). He or she is "whole"; life is "put together," and things are working together harmoniously. People with integrity have nothing to hide and nothing to fear. Their lives are open books. They are integers!… Jesus made it clear that integrity involves the whole person: the heart, the mind, and the will. The person with integrity has a single heart. He doesn't try to love God and the world at the same time (Mt 6:24-note). His heart is in heaven (THINK OF DANIEL PRAYING 3X A DAY) and that's where his treasure is (Mt 6:21-note)… An integrated person takes the command seriously "You shall love the LORD your God with all your heart (Mt 22:37). The person with integrity also has a single mind, a single outlook ("eye") that keeps life going in the right direction. After all, outlook helps to determine outcome; "a double minded man [is] unstable in all his ways" (Jas 1:8-note)… Jesus also said the person with integrity has a single will; he seeks to serve but one master… The first duty of every soul is to find not its freedom but its Master! Once you find your Master, Jesus Christ, you will find your freedom… for "if the Son makes you free, you shall be free indeed" (Jn 8:36). No one can successfully serve two masters. To attempt to do so is to become a fractional person, and a fractional person does not have INTEGRITY! Instead he is someone with a divided heart, a divided mind, a divided will." (Warren W Wiersbe - The Integrity Crisis, 1988). Commissioners and satraps - KJV renders it "presidents and princes". Extraordinary (excellent, preeminent, exceptional) - This is a key Aramaic word in this "Gentile" (Da 2-7) section of Daniel (Da 2:31, 3:22, 4:36, 5:12, 5:14, 6:3, 7:7, 7:19). 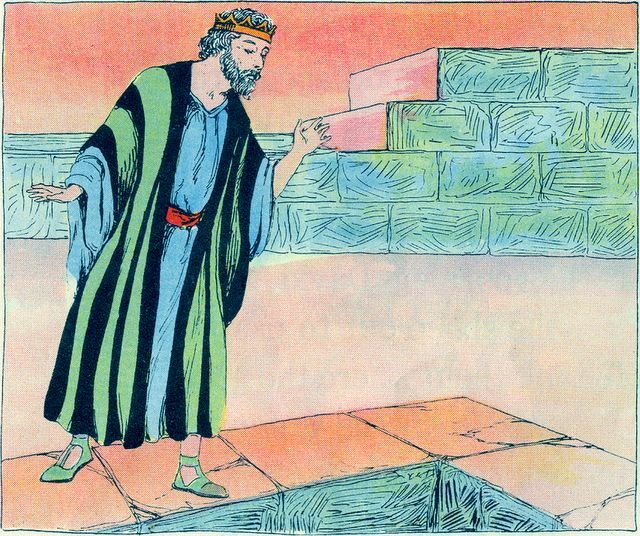 In the previous chapter we observed that King Nebuchadnezzar had appointed Daniel chief of the magicians, conjurers, Chaldeans, and diviners because of his extraordinary spirit (Da 5:11, 12). Enduring excellence for his 80+ years! What a testimony! Weekday Christians - A young man was being interviewed for a position in a small business firm. He had a neat appearance and made a good impression on the owner. He had also prepared an excellent résumé in which he listed his pastor, his Sunday school teacher, and a church deacon as references. The owner of the business studied the résumé for several minutes, then said, "I appreciate these recommendations from your church friends. But what I would really like is to hear from someone who knows you on weekdays." Until we see Christ's face. King planned to appoint him - Like Pharaoh with Joseph because "no one (was) so discerning and wise as" Joseph (Ge 41:38, 39, 40, 41). Over the entire kingdom - He was in effect the "president elect" (elected by Darius). Whether his co-presidents knew this is doubtful. Daniel seems to always rise to the top and even as Babylon ceased to be the leading world empire, he was for a very short time the third leading ruler in Babylon! (Da 5:29) It is certainly evidence of the good hand of Jehovah upon this man's life for it would be unusual (potentially even dangerous) to appoint a leader in a defeated kingdom to a post of power, not to mention the hesitancy to make such an appointment because of his age. Daniel 6:4 Then the commissioners and satraps began trying to find a ground of accusation against Daniel in regard to government affairs; but they could find no ground of accusation or evidence of corruption, inasmuch as he was faithful, and no negligence or corruption was to be found in him. Commissioners (sarekayya from sarak = "high official") - Translated presidents in other versions like KJV, ESV. Began trying to find a ground of accusation against Daniel - Why? Daniel was targeted because he was successful and he was godly. Lesson? Doing right is no guarantee everything will go right. Daniel like his three friends in Daniel 3 had become the target of envy/jealousy in the new Persian government. Beloved, we all do well to quickly confess and repent of the deadly sin of jealously which Solomon says "is severe (cruel) as Sheol (the grave)" (Song 8:6)! As someone has well said jealousy is the raw material of murder (cp Ge 4:6, 7, 8, cp Da 6:16). The man of integrity can become a target for those who lack integrity. Faithful (0540)(aman corresponding to the Hebrew verb aman = to believe) is an Aramaic verb meaning to trust in, to put one’s faith in someone or something. Used 3x in the Bible, Da 2:45 (of the trustworthiness of the dream interpretation), Da 6:4 (Daniel's personal trustworthiness) and Da 6:23 (of Daniel's faith or trust in his God.). The Lxx translates aman with pistos which in the passive sense describes persons as trustworthy and dependable, the opposite of dishonest. Of God as faithful (Heb 10:23). Negligence - Webster's 1828 = Habitual omission of that which ought to be done, or a habit of omitting to do things, either from carelessness or design. Negligence is usually the child of sloth or laziness, and the parent of disorders in business, often of poverty. Thomas Brooks - Envy, it tortures the affections, it vexes the mind, it inflames the blood, it corrupts the heart, it wastes the spirits; and so it becomes man's tormentor and man's executioner at once. Be content to be tried by a high standard, and do not wonder, and do not forget that there are keen eyes watching your conduct, in your home, in your relations to your friends, in your business, in your public life, which would weep no tears, but might gleam with malicious satisfaction, if they saw inconsistencies in you. Remember it, and shape your lives so that they may be disappointed (Ed: And even better so your Lord will not be disappointed!). They could find no ground of accusation or evidence of corruption - Daniel's integrity was beyond question. Why? He was faithful or trustworthy. If we call ourselves Christians, we are bound, by the very name, to live in such a fashion as that men shall have no doubt of the reality of our profession and of the depth of our fellowship with Christ. It is by our common conduct that they judge us. And the ‘Christian Endeavourer’ needs to remember, whether he or she be old or young, that the best sign of the reality of the endeavour is the doing of common things with absolute rightness, because they are done wholly for Christ’s sake. What stands out about Daniel (Da 6:3)? His extraordinary spirit. His exceptional excellence! WHO IS NOT HIMSELF ON SUNDAY. Works That Witness - Daniel's life revealed the reality of his faith. He conducted himself so honorably in his high office that Darius "gave thought to setting him over the whole realm" (Da 6:3). The other presidents and princes, however, were jealous and began to devise means of getting rid of Daniel. But hard as they tried, they could find nothing in his life to use against him. The Bible says that "he was faithful; nor was there any error or fault found in him" (Da 6:4). What a record! What a testimony! He was loyal and conscientious on the job--all the while giving God first place. Daniel's life was so far above reproach that his enemies had to create a situation in which his commitment to God would come into conflict with his government position. Would we stand up under close examination like this? Are we so faithful in our work that our fellow employees could "find no charge or fault" in us? It's commendable to witness for Christ. But consider the influence of a godly life and a job so faithfully performed that others could find no fault. That would silence the critics and glorify God. And prove Your good and perfect will. --Anon. your faith will be seen at work. Daniel 6:5 Then these men said, "We will not find any ground of accusation against this Daniel unless we find it against him with regard to the law of his God." Not find any ground of accusation - Daniel had kept himself unstained by the pagan, idolatrous, immoral world (kosmos - see word study) in which he lived (cp Jas 1:27-note) Besides being jealous, these men may well have sought his demise because of his integrity and incorruptibility which restricted their opportunities to siphon funds from the king's revenue that came in from the provinces. Wiersbe - It’s certainly a commendable thing when people possess character so impeccable that they can’t be accused of doing wrong except in matters relating to their faith. (Wiersbe, Warren: Be Resolute (Daniel)- Determining to Go God's Direction). Do (present imperative = command to make this our lifestyle. God commands it so that means He will enable it beloved!) all (how many) things without grumbling or disputing (Why?) that you may prove yourselves to be blameless and innocent, children of God (see 1Jn 3:1-note, 1Jn 3:2-note, 1Jn 3:3-note above reproach in the midst of a crooked and perverse generation, among whom you appear as lights in the world (The world is watching you just like they were watching Daniel) (Php 2:14,15-note). Comment: How is it humanly possible to do even "some" things without grumbling, much less "all things"?! You guessed it… it is not humanly possible but it is superhumanly possible! Read the verses in the immediately preceding context (Php 2:12-note, Php 2:13-note) and you will note that it is God's indwelling Spirit (implied) in us that gives us (1) the desire NOT to grumble and (2) the power NOT to grumble! I (in my own strength) can't NOT grumble. God never said that I could. But He can (in and through me) and He has always said He would! But note it is not "Let go and let God" but "Let God and go!" (His power, my part - His sovereignty, my responsibility!) Praise His Spirit's all sufficient grace in Christ (cp 1Co 15:10-note, 2Cor 3:5, 6-note, 2Cor 12:9-note, 2Co 12:10-note)! Unless we find it against him with regard to the law of his God - How did they know this? Their conclusion makes it clear that Daniel did not hide his faith in the one true God. They knew he was a strict monotheist, and therefore planned to ensnare him by forcing him to refuse to worship other gods and continue worshiping His God. He was not ashamed to be seen praying to his God. Am I ashamed or at least "self conscious" about offering even a simple prayer in a restaurant before I eat my meal? note the very unfavorable soil in which a character of singular beauty and devout consecration may be rooted and grow. What sort of a place was that court where Daniel was? Half shambles and half pigsty. Luxury, sensuality, lust, self-seeking, idolatry, ruthless cruelty, and the like were the environment of this man. And in the middle of these there grew up that fair flower of a character, pure and stainless, by the acknowledgment of enemies, and in which not even accusers could find a speck or a spot. There are no circumstances in which a man must have his garments spotted by the world. However deep the filth through which he has to wade, if God sent him there, and if he keeps hold of God’s hand, his purity will be more stainless by reason of the impurity round him. You will always find that people who have any goodness in them, and who live in conditions unusually opposed to goodness, have a clearer faith, and a firmer grasp of their Master, and a higher ideal of Christian life, just because of the foulness in which they have to live. It may sound a paradox, but it is a deep truth that unfavourable circumstances are the most favourable for the development of Christian character. For that development comes, not by what we draw from the things around, but by what we draw from the soil in which we are rooted, even God Himself, in whom the roots find both anchorage and nutriment. And the more we are thrown back upon Him, and the less we find food for our best selves in the things about us, the more likely is our religion to be robust and thorough-going, and conscious ever of His presence. Resistance strengthens muscles, and the more there is need for that in our Christian lives, the manlier and the stronger and the better shall we probably be. Let no man or woman say, ‘If only circumstances were more favourable, oh, what a saint I could be; but how can I be one, with all these unfavourable conditions? With regard to the law of his God - The only way to "catch" Daniel would be to devise a plot wherein he was forced to chose between obedience to God and obedience to Medo-Persian law. Daniel didn't care if the whole world differed from him, for he knew God's Word and knew the right thing to do and not to do! He knew that he had to act on his convictions (a firmly held belief or opinion; the state of being convinced of error or compelled to admit the truth; the state of being convinced or convicted by conscience) We must be careful to make sure our beliefs are properly grounded. But once we are certain of that, we should be like Daniel, who not only had convictions but the courage to stand for them. When you are tempted to compromise your principles, don't give in. Dare to be a Daniel! Daniel 6:6 Then these commissioners and satraps came by agreement to the king and spoke to him as follows: "King Darius, live forever! Commissioners and satraps - A group of about 122 men which may well have impressed King Darius when they made their appeal. Darius failed to notice that Daniel was not in the group and it cost him dearly! As a believer perhaps in a completely pagan environment, have you have felt like everyone was opposed to you? Remember that you plus God is a majority regardless of the numbers arrayed against you! Came by agreement - This was clearly a "plot" but not an orderly one! The Aramaic verb regash primarily signifies to be in tumult, to be restless, to be turbulent, to assemble in a throng so that the picture it conveys is that of a "mob scene", not an orderly gathering. "Rabble rousers" comes to mind! Why are the nations in an uproar (ragash), and the peoples devising a vain thing? Comment: Ragash denotes the uproar and plotting of the wicked against the righteous. Think of the picture of a lynch mob gathering together to mete out their brand of justice. Note in Psalm 2 that the wicked are coming against the LORD and His Messiah (Mashiyach)! Daniel 6:7 "All the commissioners of the kingdom, the prefects and the satraps, the high officials and the governors have consulted together that the king should establish a statute and enforce an injunction that anyone who makes a petition to any god or man besides you, O king, for thirty days, shall be cast into the lions' den. All… have consulted together - An unholy conspiracy! A flagrant falsehood! This was an outright lie (like their father the devil - Jn 8:44, Ge 3:1,2,3,4,5). Daniel had not been consulted. We know because of his subsequent actions. He would have never approved of this 30 day "law" calling for petitioning of a man. They are "massaging" the King's ego! Makes a petition - Literally "requests a request” which in context are clearly of a religious nature and thus are not petitions any general (general requests) but specifically petitions in the form of prayer. They thought that they had discovered Daniel's "Achilles heel". They did not understand the depth of this man's integrity (or perhaps they did and knew this would cost him his life for he would rather die than compromise). Makes a petition to any god besides you - Since they are going to Darius with their petitions, he is functioning as an intermediary or a priest if you will. They knew that prayer to anyone other than Jehovah would be a form of idolatry. In short, these pernicious plotters know that Daniel will never agree to this law because he is a man of impeccable integrity. Any god or man besides you - They flattered Darius with the idea that he could be "god for a month"! They were appealing to Darius' pride, a good place to appeal, for he fell for the flattery. Flattery is the art of telling a person exactly what he thinks of himself which explains why it is so effective! Wiersbe writes that "It has well been said that flattery is manipulation, not communication, and in his pride, Darius succumbed to the flattery of evil men. “For there is no faithfulness in their mouth; their inward part is very wickedness; their throat is an open sepulcher; they flatter with their tongue” (Ps. 5:9). (Wiersbe, Warren: Be Resolute (Daniel)- Determining to Go God's Direction). Spurgeon commenting on Ps 5:9 gives a picturesque description of those who flatter - "A smooth tongue is a great evil; there are human anteaters that with their long tongues covered with oily words entice the unwary and make their gain thereby." Daniel 6:8 "Now, O king, establish the injunction and sign the document so that it may not be changed, according to the law of the Medes and Persians, which may not be revoked." Law of the Medes and Persians, which may not be revoked - Nebuchadnezzar had absolute power with no such restriction that he could not revoke a law. The interesting fact is that the devotion of the Medes and Persians to established laws eventually made it difficult for their government to function efficiently. They found themselves swamped in a bureaucratic quagmire due to the profusion of their laws and this fact appears to be the main reason the Medo­Persian form of government was termed inferior to that of Nebuchadnezzar, the absolute dictator of Babylon, whose slightest word was law. (Da 2:38, 39). If it pleases the king, let a royal edict be issued by him and let it be written in the laws of Persia and Media so that it cannot be repealed, that Vashti may no longer come into the presence of King Ahasuerus, and let the king give her royal position to another who is more worthy than she. (Es 1:19-note). Daniel 6:9 Therefore King Darius signed the document, that is, the injunction. Therefore - see term of conclusion for the value of observing and interrogating this term. Signed the document - Compare There this Persian practice in Esther 1:19, 8:8 where a seal guaranteed the validity of the decree. Now when Daniel knew the document was signed - Test time Daniel! He understood the truth that every trial in life is a test of one's character. As a result, not only was Daniel not dissuaded from his devotion, but he even had a desire to immediately seek the face of God. Prayer is a good place to go when we find ourselves being tempted. Daniel's continual communion with the living God kept him prepared for unexpected testing. Character is tested by what one does when we think no one else sees (but Pr 15:3-note). Daniel did not pray to be seen, but he was seen when he prayed. He did not debate or hesitate. He prayed like he had always done. Spurgeon - Daniel did not deliberate for a single minute. When we know our duty, first thoughts are the best. I greatly admire one feature in Daniel’s decision. He did not alter his accustomed habit in any single particular. Without disguise and without parade he pursued the even tenor of his way. He does not appear to have taken council of his friends, or to have summoned his servants, and charged them not to let any intruder come in. Neither did he adopt any measure to escape his enemies. Not one jot of anxiety did he betray. His faith was steadfast, his composure unruffled, his conduct simple and artless… It might be asked, perhaps, “Should not Daniel obey the king?” Certainly kings’ laws are to be respected; but any law of man that infringes the law of God is, ipso facto, null and void at once. It is the duty of every citizen to disregard every law of earth which is contrary to the law of heaven. So Daniel felt that the risk of being put into a den with lions was nothing to the risk of being put into hell, and he chose the smaller risk, and in the name of God he went straight on. Look at John Bunyan when they bring him up before the magistrates and tell him he must not preach! “But I will preach,” said he, “I will preach to-morrow by the help of God.” “But you will be put in prison again.” Never mind, I will preach as soon as I get out.” “But you will be hanged, or kept m prison all your life.” “If I lie in prison,” said he, “till the moss grows upon my eyelids, I can say nothing more than this, that with God’s help, I will preach whenever I get a chance.” Do not tell me that these are non-essentials. To men who will follow the Lamb whithersoever he goeth, even the opening or the shutting of a window, if need be, is essential. Be jealous over what are called “trifles.” They may be mere straws, but they show which way the wind blows. If one's conduct is the overflow of one's doctrine, then Daniel's conduct speaks volumes about the holiness of his doctrine. What we believe should always affect how we behave. When Daniel's "belief was challenged", he knelt in prayer. How do I respond when I "challenged" to disobey God's Word? 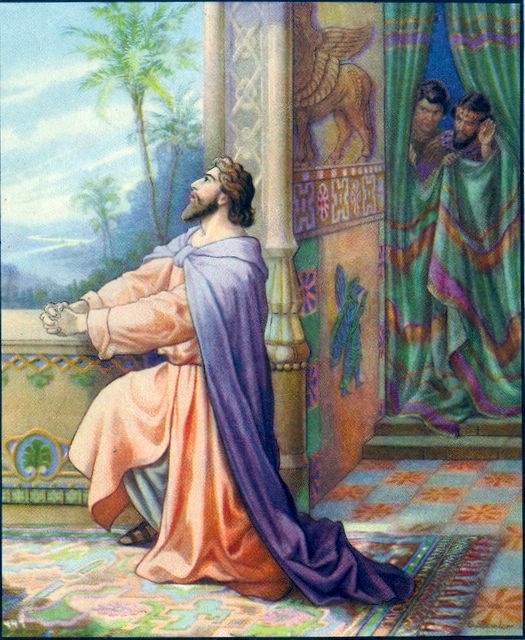 Windows open to Jerusalem (Compare 1Kings 8:33, 35, 38, 48) - Notice that Daniel did not open the window to deliberately defy the king's injunction but his window was routinely open when he prayed. Adam Clarke - When the Jews were in distant countries, in prayer they turned their faces towards Jerusalem; and when in Jerusalem, they turned their faces towards the temple. Solomon, in his prayer at the dedication of the temple, 1 Kings 8:48, had entreated God to hear the prayers of those who might be in strange lands, or in captivity, when they should turn their faces towards their own land, which God gave unto their fathers; and towards the city which he had chosen, and the house which was dedicated to his name. It was in reference to this that Daniel turned his face towards Jerusalem when he prayed. 1Kgs 8:48-52 if they return to Thee with all their heart and with all their soul in the land of their enemies who have taken them captive, and pray to Thee toward their land which Thou hast given to their fathers, the city which Thou hast chosen, and the house which I have built for Thy name; then hear their prayer and their supplication in heaven Thy dwelling place, and maintain their cause, and forgive Thy people who have sinned against Thee and all their transgressions which they have transgressed against Thee, and make them [objects of] compassion before those who have taken them captive, that they may have compassion on them. (for they are Thy people and Thine inheritance which Thou hast brought forth from Egypt, from the midst of the iron furnace), that Thine eyes may be open to the supplication of Thy servant and to the supplication of Thy people Israel, to listen to them whenever they call to Thee. He continued kneeling… praying and giving thanks before God - Daniel was too old to begin compromising now, but this story does make the point that we will never be too old or too "spiritually mature" that we won't be tempted to compromise! Let us stay alert, watching and praying like Daniel (cp Mt 26:41-note). Daniel’s prayers were bold, obedient (knew the document was signed), consistent (as he had done previously), humble (kneeling), thankful (cp 1Th 5:18-note), filled with petition (request) and supplication (earnest entreaty) (Da 6:11). Matthew Henry - The life of a Christian is a race, wherein he must run, and hold on, if he would obtain the prize. It is not enough that we profess Christianity, but we must run well, by living up to that profession. Many who set out fairly in religion, are hindered in their progress, or turn out of the way. It concerns those who begin to turn out of the way, or to tire in it, seriously to inquire what hinders them. What about one's posture in prayer? Do you need to kneel? God is interested not so much in the position of our body as in the position of our heart. A humble heart is a dependent heart which in turn bows to God and is thereby in the best position to receive God's grace (Jas 4:6). When one knows how to kneel in prayer he has no problem standing firm against opposition in the strength of the Lord. Martyn Lloyd-Jones once said that "Man is at his highest and greatest when upon his knees he comes face to face with God." Spurgeon - DANIEL’S PRAYERFULNESS WAS THE SECRET OF HIS POWER. Daniel was always a man of prayer. If you saw him great before the people, the reason was because he was great before his God. He knew how to lay hold of divine strength, and he became strong. He knew how to study divine wisdom, and he became wise. We are told that he went to his house to pray. This showed that he made a business of prayer, and finding it neither convenient to his circumstances nor congenial to his mind to pray in the midst of idolaters, he had chosen to set apart a chamber in his own house for prayer. It is well to have, if we can have, a little room, no matter how humble, where we can shut to the door, and pray to our Father who is in heaven, who will hear and answer. He was in the habit of praying thus three times a day. Perhaps he thought that this was prudent economy, for, if he had so much to do, he must pray the more; as Martin Luther said, “I have got so much to do to-day that I cannot possibly get through it with less than three hours of prayer.” So, perhaps, Daniel felt that the extraordinary pressure of his engagements demanded a proportionate measure of prayer to enable him to accomplish the weighty matter he had on hand. A singularity in his manner is noticeable here. He had been in the habit of praying with his windows open towards Jerusalem. Thus openly did he ignore the decree! With such a royal courage did he lift his heart above the fear of man, and raise the conscience above the suspicion of compromise. He loved Jerusalem, and his prayers were for it. Hence he looked that way in his prayer. And I think also he had an eye on the altar. We worship with our eye to Christ. Oh, for Daniel’s prayerful spirit! Pray without ceasing (1 Th. 5:17-note). Continue steadfastly in prayer (Rom. 12:12-note). Pray morning, noon, and night (Ps. 55:17). Pray always and do not get discouraged (Lk. 18:1). will lead to praying fervently. Our only help comes from the Lord. If earthly authorities command what is clearly contrary to God’s law, a Christian is absolved from obedience, and cannot be loyal unless he is a rebel. That is how our forefathers read constitutional obligations. That is how the noble men on the other side of the Atlantic, fifty years ago, read their constitutional obligations in reference to that devilish institution of slavery. And in the last resort—God forbid that we should need to act on the principle—Christian men are set free from allegiance when the authority over them commands what is contrary to the will and the law of God. And for us, in our little lives, the motto, ‘This did not I, because of the fear of the Lord,’ is absolutely essential to all noble Christian conduct. Unless you are prepared to be in the minority, and now and then to be called ‘narrow,’ ‘fanatic,’ and to be laughed at by men because you will not do what they do, but abstain and resist, then there is little chance of your ever making much of your Christian profession. Toward Jerusalem - The site of the Holy Temple, where prior to its destruction the Shekinah cloud had manifested the glory of Jehovah. To be sure the glory had departed in 586BC just before the Temple was destroyed (cp Ezek 11:23-note), but God had promised to return (Ezek 43:2). He had also promised to restore Jerusalem (Jer 29:10, 14). Jerusalem was still the city of God. As an aside it is interesting that Muslims pray toward Mecca five times a day. Daniel could have closed the windows. Daniel could have prayed in another room. Daniel could have been more discreet. But Daniel was a man of integrity with uncompromising devotion to His great God who had been so faithful to him for 80+ years. Scripture makes one exception to the charge to be subject to the government and that is when obedience to civil authority would require disobedience to God’s Word (Ex 1:17 Da 3:16, 17, 18 Da 6:7,10 Acts 4:19, 20, 5:28, 29). If I forget you, O Jerusalem, may my right hand forget her skill. May my tongue cling to the roof of my mouth If I do not remember you, If I do not exalt Jerusalem Above my chief joy. (Ps 137:5, 6). And I (David), in the abundance of Thy kindness, I enter Thy house, I bow myself toward Thy holy temple (no actual temple at that time but Hebrew word also used of the tabernacle 1Sa 1:9; 3:3) in Thy fear. Three times a day - Daniel had prioritized prayer and a daily pattern. Recall he was one of 3 commissioners (presidents) and could have easily rationalized that he was simply too busy to pray! We need to imitate Daniel (Heb 6:12). We need to make it a priority because if we don't, prayer will soon be squeezed out of our busy schedule. How much priority did Daniel give to prayer? Prayer was so important to Daniel that he was willing to die rather than give up his right to pray to God! Now, that's a picture of commitment! pray in the easy times. David had a similar pattern of prayer. Knowing who these men are (Daniel and David), what does this say about the role of prayer in the life of one who would desire to also be a man after God's own heart (Acts 13:22)? Spurgeon comments: Often but none too often. Seasons of great need call for frequent seasons of devotion. The three periods chosen are most fitting; to begin, continue, and end the day with God is supreme wisdom. Where time has naturally set up a boundary, there let us set up an altar stone. The psalmist means that he will always pray; he will run a line of prayer right along the day, and track the sun with his petitions. Day and night he saw his enemies busy (Psalms 55:10), and therefore he would meet their activity by continuous prayer. And he shall hear my voice. He is confident that he will prevail; he makes no question that he would be heard, he speaks as if already he were answered. When our window is opened towards heaven, the windows of heaven are open to us. Have but a pleading heart and God will have a plenteous hand. Daniel's priority list had fellowship with God at the top. This explains in large measure the godly life and character of this man. What is at the top of your priority list? As he had been doing previously - If Daniel was 85 yo this would be over 95,000 prayers (at 3x/day)! Talk about a hard habit to break! Remember he knew the law had been signed so he knew that his prayer was his "death warrant" for the lion's den! As noted above, as one of 3 commissioners, he would have been very busy with worldly affairs, but he was never too busy to tend to his heavenly affairs. How about you? Are you too busy to pray? If you answered "Yes", then you are simply too busy! Plan your praying, then pray your plan. Pigeon Walk - Have you ever wondered why a pigeon walks so funny? It's so that it can see where it's going. Because a pigeon's eyes can't focus as it moves, the bird actually has to bring its head to a complete stop between steps in order to refocus. So it proceeds clumsily--head forward, stop, head back, stop. In our spiritual walk with the Lord, we have the same problem as the pigeon: We have a hard time seeing while we're on the go. We need to stop between steps--to refocus on the Word and the will of God. That's not to say we have to pray and meditate about every little decision in life. But certainly our walk with the Lord needs to have built into it a pattern of stops that enable us to see more clearly before moving on. Daniel's practice of praying three times a day was an essential part of his walk with God. He realized that there's a certain kind of spiritual refocusing that we can't do without stopping. His stops gave him a very different kind of walk--one that was obvious to those around him. Where I can spend a little time in prayer. THE CHOSEN hour. It was at the time when Daniel's enemies appeared to have accomplished his downfall and death--"when the writing was signed '--that this heroic statesman knelt down and prayed, and gave thanks to God. These are times when prayer is the only way out of our perplexities. George Muller said: "Our very weakness gives opportunity for the power of the Lord Jesus Christ to be manifested. That blessed One never leaves and never forsakes us. The greater the weakness, the nearer He is to manifest His strength; the greater our necessities, the more have we ground to rely on it that He will prove Himself our Friend. This has been my experience for more than seventy years; the greater the trial, the greater the difficulty, the nearer the Lord's help. Often the appearance was as if I must be overwhelmed, but it never came to it, and it never will. More prayer, more faith, more exercise of patience, will bring the blessing. Therefore our business is just to pour out our hearts before Him; and help in His own time and way is sure to come." The chosen direction. "His windows open towards Jerusalem." There the Holy Temple had stood, and the Altar of Incense; there God had promised to put His Name and meet His people. When we pray, our windows must be open towards our blessed Lord, who ministers for us in Heaven, mingling the much incense of His intercession with the prayers of all mints (Heb. 7:25; Rev. 8:3). The chosen attitude. "He kneeled upon his knees." It is most appropriate to kneel before God in homage and worship. St. Paul bowed his knees, even though his hands were chained, to the Father of our Lord Jesus Christ (Eph 3:14). But we can pray also as we walk, or sit, or ride. Nehemiah flashed a prayer to the God of Heaven before he answered the king's question, but he also prayed before God day and night. Let us contract the habit of praying and giving thanks three times a day. At even, morning, and noon, let God hear your voice. Glory in Thy perfect love. AMEN. Daniel 6:11 Then these men came by agreement and found Daniel making petition and supplication before his God. BUT CHEERFULLY ACCEPT THE CONSEQUENCES! Came by agreement - Unified in their evil hearts and their evil intent. why should I forsake Him now? Making petition (asking) and supplication (asking for mercy) before his God - "Before" (Aramaic = in front of!) is an awesome and beautiful reminder that all prayer is as if the petitioner is kneeling directly in front of God's throne of grace (Heb 4:16-note)! Daniel could have closed his windows or gone somewhere else to pray. He could have done this if he had been unbelieving and frightened, but in fact Daniel knew that when a man feared the LORD he did not have to fear man. Daniel looked away from his circumstances and instead choose to focus on His omnipotent God, Who is strong enough and is able to deliver if that be His will. Faithfulness in prayer gets Daniel in the lion's den, whereas for many of us unfaithfulness in prayer is what gets us in the lion's den (so to speak)! 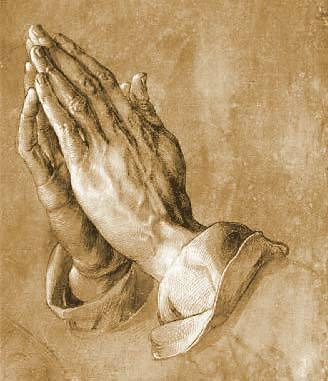 Supplication - Humble, earnest request as by one begging on bended knee. Daniel 6:12 Then they approached and spoke before the king about the king's injunction, "Did you not sign an injunction that any man who makes a petition to any god or man besides you, O king, for thirty days, is to be cast into the lions' den?" The king replied, "The statement is true, according to the law of the Medes and Persians, which may not be revoked." The king replied - Notice how they got him first to reaffirm his own law before they told him of Daniel's disobedience. They were cunning and crafty like their father Satan (Ge 3:1, Jn 8:44). The law of the Medes and Persians - This emphasizes that Darius the Mede was not an independent ruler over Babylon. Daniel 6:13 Then they answered and spoke before the king, "Daniel, who is one of the exiles from Judah, pays no attention to you, O king, or to the injunction which you signed, but keeps making his petition three times a day." Daniel… one of the exiles from Judah - It has been 70 years and these evil men choose not to refer to Daniel as one of the commissioners, instead disrespectfully, disdainfully referring to him as if he were a stranger and foreigner in their midst and from a conquered people on top of that! Pays no attention to you - They focused on Daniel's supposed disrespect of the king rather than on his devotion to his God. This accusation is similar to that made against Daniel's 3 friends. Daniel 6:14 Then, as soon as the king heard this statement, he was deeply distressed and set his mind on delivering Daniel; and even until sunset he kept exerting himself to rescue him. Then - He knew he had been trapped like a rat in a cage! His best man's life was now in jeopardy and he was partially responsible. He was deeply distressed ("It was greatly displeasing to him") (Lxx = lupeo = caused to have severe mental and emotional distress, vexed) - He now recognized that he had been deceived by the lies of these jealous, anti-Semitic officials. Daniel 6:15 Then these men came by agreement to the king and said to the king, "Recognize, O king, that it is a law of the Medes and Persians that no injunction or statute which the king establishes may be changed." Came by agreement - Emphasizes this was a plot, a conspiracy. Injunction… may be changed - They wanted to reinforce the seriousness of the king's own decree. They knew he was deeply distressed and probably feared he might even break the law of the Medes and the Persians. Daniel 6:16 Then the king gave orders, and Daniel was brought in and cast into the lions' den. The king spoke and said to Daniel, "Your God whom you constantly serve will Himself deliver you." "May your God, Whom you serve continually, rescue you!" (ESV, NLT, CSB, RSV also renders it in the form of a prayer. Lxx translation does not take the form of a prayer). Your God… will deliver you (Lxx = exaireo = literally means will take you out, to rescue from danger - even as Peter was rescued by His angel Acts 12:11, cp Jesus' promise to Paul to rescue him - Acts 26:17, Gal 1:4-note) - This is certainly his human hope ("hope so") but it is not necessarily an expression of assurance or faith because the king later asks "has your God… been able to deliver you?" Faith says "He is able". Daniel 6:17 A stone was brought and laid over the mouth of the den; and the king sealed it with his own signet ring and with the signet rings of his nobles, so that nothing would be changed in regard to Daniel. How did Daniel respond to this life threatening situation? We know that he had prayed and so his heart was prepared, but we cannot say otherwise for the text is silent. Although for a man in his 80's who has served so faithfully, one cannot help but wonder that not only did he have no fear, but that he was likely even ready to go home (cp 2Co 5:6-note , 2Cor 5:8-note). We'll ask him when we meet in the presence of our LORD! King sealed (Lxx = sphragizo = of sealing believers secure in their salvation - Eph 1:13-note, Eph 4:30-note) it with his own signet ring and with the signet rings of his nobles - For security, to assure there would be no covert rescue or escape. Any attempt to open the lion's den would be detectable by a broken seal (cp seal in Eph 1:13). This event reminds us of another tomb that was "made… secure" (Mt 27:60,66) by the Roman authorities, but to no avail for our Lord Jesus Christ came forth alive, even as Daniel came forth alive (some see Daniel's coming forth as a foreshadowing of the resurrection)! Daniel 6:18 Then the king went off to his palace and spent the night fasting, and no entertainment was brought before him; and his sleep fled from him. His sleep fled - His conscience was not clear. His heart was burdened. Sleep was fleeting for the king while Daniel slept like a baby. Man's best rest (king's palace) contrasted with God's best rest (in the Lion's den or wherever, but with the presence of the Lord and with a clear conscience - that is real rest - Study "Rest" in Scripture). As Pritchard says "it is better to be a child of faith in a lion’s den than to be a king without God in a palace." Daniel 6:19 Then the king arose at dawn, at the break of day, and went in haste to the lions' den. Break of day - literally at the brightness of the dawning, as soon as the sun was visible, he was off to the lion's den! Then - After a fitful night of tossing and turning. Went in haste - Surely wondering as he ran to the den "Is Daniel's God really able to deliver"? (Da 6:16). With a troubled voice - It is ironic that the king's royal surroundings and his troubled conscience afforded him a far less comfortable night of rest than that of Daniel who had a completely clear conscience (Da 6:22, 2Ti 1:3-note) sleeping with the lions and fellowshipping with the Angel of God! God does have a fascinating sense of humor. Daniel servant (Lxx = doulos) of the living God - Would it be that all God's children would be known by this title! And would it be that all God's children lived so that the unbelievers around them recognized their God as "the living God." Daniel's life of integrity was a shining light in the midst of a dark work and Darius recognized the difference. Some have commented that although there is no Biblical evidence that King Darius ever became a believer, that possibility is not inconceivable considering the "aroma of life" (cp 2Cor 2:14, 15, 16) to which he was exposed. I agree. Won't heaven be an interesting place! Some who you never thought will be there. And sadly some you surely thought would be there won't be! You constantly serve - Repeat of Da 6:16. Clearly Darius recognized Daniel's loyalty to His God. Daniel's consistent work ethic toward God is another mark of his integrity. Your God - Like Nebuchadnezzar before him, Darius has a reasonable respect for God, but does not acknowledge Him as his God (as we think Nebuchadnezzar finally did after humbling his heart in Daniel 4). Your God… able to deliver (cp the testimony of the 3 friend in Da 3:17 "God… is able") - Daniel did not know that rescue would be forthcoming. Courage and steadfastness in faith motivated him to continue his walk with God by faith not by sight. Pritchard writes that Darius. "recognized the genuineness of Daniel’s faith and though he did not believe himself, he hoped that Daniel’s God would deliver him." Daniel 6:21 Then Daniel spoke to the king, "O king, live forever! O king, live forever! - Daniel still in the lion's den was in better composure than was the king safe above the den. While this is a common idiomatic way of addressing kings, one cannot help but think it conveys more from the heart of Daniel than simply "Good morning, king"! In fact, what is ironic, even humorous about his greeting? Daniel a "dead man" in the den is alive, asking (in a sense) for eternal life for a pagan king (the real dead man - Eph 2:1)! Interesting! God records these stories to stir up faith in our hearts. Then when we find ourselves facing the giants or the lions or the impossible "Red Sea" obstacle, we can cry out to Jehovah for deliverance, knowing that He is able to deliver us. Remember that when God allows us to go through one of these difficult stormy situations, He always has a purpose. Some storms are sent for correction (discipline) as with Jonah, some storms are for instruction as with the disciples, and some storms are sent that we might be used to bring glory to the Most High God as in the case of the miraculous deliverance of Daniel from the Lion's den. Daniel 6:22 "My God sent His angel and shut the lions' mouths and they have not harmed me, inasmuch as I was found innocent before Him; and also toward you, O king, I have committed no crime." My God sent His angel - While this could be a created angel, it is possible that it is the Angel of the LORD. In Da 3:28-note we read a similar phrase that God "sent His Angel and delivered His servants who put their trust in Him" (cp Da 3:25-note). In that context, we concluded that the Angel was very likely the Angel of the LORD, the preincarnate appearance of Christ. And in Da 6:23 the king states Daniel's delivery (like the 3 Hebrew boys) was related to the fact that he had trusted his God. I was found innocent before Him - A perfect illustration of Daniel's very name = "God is my Judge" and the Supreme God overturned the accusation against Daniel! No injury whatever - Complete, total deliverance by Jehovah, just as with his 3 fire tested friends (Da 3:27). As we have said before God’s servants are immortal until their work is done. This does not mean that His servants are always delivered from death. Taken up out of - This suggests it was a pit. He had trusted in his God - The Aramaic word for trusted (believed) is aman which is related to Hebrew word (See word study of Hebrew word aman) at the heart of which conveys the idea of certainty or firmness. Faith is firm trust in another. It is utter dependence upon the veracity of another. Faith is not a blind leap into the dark but a confident commitment to the One about Whom abundant evidence bears ample testimony of His eternal, immutable trustworthiness. Why did God deliver Daniel? Because of his steadfast faith and because he was innocent (Da 6:22). This passage demonstrates that faith is in a sense an "action verb". In other words, even the pagan king could "see" Daniel's faith by virtue of his refusal to compromise even in the face of the prospect of being the main course of the lion's dinner menu! Heb 11:33 who by faith conquered kingdoms, performed acts of righteousness, obtained promises, shut the mouths of lions. Whether faith closes the mouth of the lion, or gives the soul such an entire deliverance from all fear, it is the same in essence and operation, and shows its heavenly temper with the ease with which it overcomes the trial. Lessons for the Ages - Children love to hear the Bible story of Daniel in the lions' den. But that account has valuable lessons for all of us. Let's look again at the faith of an elderly man named Daniel. Prayer is a lifelong task. Daniel was at least 80 years old when this story took place. Yet Scripture says he prayed and gave thanks to God "three times that day … as was his custom since early days" (Da 6:10). Daniel had been a man of prayer his whole life—from his youth in Jerusalem all the way through his 65 years in Babylon. Faithfulness is an undeniable testimony. When Daniel was thrown into the lions' den, Darius said, "Your God, whom you serve continually, He will deliver you" (Da 6:16). Daniel's testimony of trust in God was well-known (Da 6:1-4)—even to a king who wanted people to worship him instead of God. God rewards faithfulness. Daniel was spared "because he believed in his God" (Da 6:23). As a result, the king told his people to turn their faith toward God. Daniel continued to prosper under the reign of Darius (Da 6:28). No storm can ever shake. so that we may trust His faithfulness. Daniel 6:24 The king then gave orders, and they brought those men who had maliciously accused Daniel, and they cast them, their children and their wives into the lions' den; and they had not reached the bottom of the den before the lions overpowered them and crushed all their bones. Brought those men who had maliciously accused Daniel - This is the law of sowing and reaping in action (Gal 6:7, 8, cp Dt. 19:16, 17, 18, 19, 20, 21). Persian kings were known for being cruel in their treatment of enemies and Darius was no exception tossing in their families for good measure, by this preventing any family members from seeking to take revenge on the king. This "den debacle" could have been worse had Darius chosen to also toss in the 120 satraps who were in effect co-conspirators (some think he did execute all of them). Keil - The condemning to death of the wives and children along with the men was in accordance with Persian custom, as is testified by Herodotus, iii. 119, Amm. Marcell. xxiii. 6. 81, and also with the custom of the Macedonians in the case of treason (Curtius, vi. ii. ), but was forbidden in the law of Moses; cf. Deut. 24:16. Maliciously accused - Literally this phrase means “eaten his pieces,” (Akal - 399 = eat + Qerats = 7170 = pieces) and is an idiom which means they had spoken maliciously or slandered (Also used in Da 3:8). Daniel had been falsely accused of disloyalty to the king. They had not reached the bottom of the den before the lions overpowered them - This fact is a striking contrast with Daniel's deliverance and underscores the power of God to deliver completely. These lions were not what some liberal commentators have described (in order to explain away the miracle) - tame, toothless, tired or satiated! He who digs a pit will fall into it, and he who rolls a stone, it will come back on him. (Pr 26:27). Daniel 6:25 Then Darius the king wrote to all the peoples, nations and men of every language who were living in all the land: "May your peace abound! Then Darius - Theologically this is quite a proclamation. Darius the king wrote to all the peoples, nations and men of every language - As a result of Daniel's faithfulness, the renown of Daniel's God was proclaimed throughout the 120 provinces of Medo-Persia. As noted elsewhere, while the Jews refused to fulfill their task to be light to the Gentiles, God used a pagan king to announce His majesty and splendor to the known world! One wonders what impact these truths had on the Gentile hearts? One faithful man affected literally an entire Gentile empire! How great is our God! Daniel 6:26 "I make a decree that in all the dominion of my kingdom men are to fear and tremble before the God of Daniel; For He is the living God and enduring forever, And His kingdom is one which will not be destroyed, And His dominion will be forever. I make a decree - This is a remarkable proclamation lauding many of the attributes of God and kingdom. Clearly the omnipotent God God could have orchestrated events so that Daniel would not have been thrown into the lion's den, but by allowing him to go in and bringing him out unhurt, the Lord received great glory! We need to remember this story the next time we try to escape the fiery trial, not realizing that the Lord might desire us to walk through that He might be greatly glorified! Daniel 6:27 "He delivers and rescues and performs signs and wonders In heaven and on earth, Who has also delivered Daniel from the power of the lions." He delivers and rescues - Darius had witnessed divine deliverance from a den! Some commentators make the point that Daniel's great deliverance (as well as that of his 3 friends in Daniel 3) serves to foreshadow the physical and spiritual deliverance of Israel in the last days as described in Zechariah (Zech 14:1, 2, 3, 4, 5, 6, 7, 8, 9, 10, 11) and Romans 11 (Ro 11:26, 27-note), as well as other passages. Daniel 6:28 So this Daniel enjoyed success in the reign of Darius and in the reign of Cyrus the Persian. So this Daniel enjoyed success - Because of the intervening hand of the living God. I. Integrity. "We shall not find any occasion against this Daniel, except we find it concerning the law of his God" (Da 6:5). His enemies themselves are witnesses to the purity of his life, His character was invulnerable. As a man of prayer and of faith he was faultless, even in the details of his arduous business life. The undercurrent of his nature was as pure as the upper. This was the secret of his moral strength. The daily life is perhaps the severest test of the Christian character, but the pure in heart shall see God, and seeing Him they shall endure. II. Steadfastness. "When Daniel knew that the writing was signed he went.. .and prayed, and gave thanks before God, as he did aforetime" (Da 6:10). Their plot was to get the law of the Medes (unalterable) to clash with the law of Daniel and his God. Although he knew that they had succeeded in making and setting a trap for his feet, he trusted in God and went on as aforetime. Circumstances, adverse as they were, had no effect in changing his holy purpose to be true to God, and his own conscience. General Gordon, when in the Sudan, used to lay his handkerchief at the door of his tent each morning while he prayed, and no one dared to enter till the signal was removed. Courage, brother, do not stumble in your prayer life. Be steadfast in your faith and practice. III. Sufferings. He was doubtless persecuted through envy (Da 6:3). Their dastardly scheme seemed to succeed. Daniel is condemned to the lions. This was the Persians' mode of capital punishment, as the fiery furnace was that of the Babylonians. This is one strong proof of the authenticity of the book. This was a great crisis in the experience of the prophet. Must all be sacrificed to appease the wrath of these haters of godliness? Every sacrifice we make for God brings for us a fuller enjoyment of the salvation of God. IV. Deliverance. "My God hath shut the lions mouths," etc. (Da 6:20-22). This was a new experience of the power of God. While his enemies are rejoicing over his supposed destruction, Daniel is rejoicing in a new salvation. God will vindicate the faith of His own true servant. He is able to do exceedingly above all that we think. V. Faith. "Because he believed in his God" (Da 6:23, l.c.). God will not deny Himself. To trust Him is to put Him on His honour. The secret of victory in the Christian life lies deep down in our oneness of life and purpose with Him. Christians who live for God should expect opposition...The jealous satraps are never far away. Ironically, the more honest you are, the sooner they will attack. God can use us to touch unlikely people when we are faithful to Him...We never know who is watching us or what they are looking for, but this story teaches us that not every unbeliever hates Christians. For every satrap out there planning our downfall, there is a Darius keeping an eye on us, hoping that our faith may prove to be genuine. Such people have little or no faith and deep inside, they want what we have… Last week I listened to a successful businessman tell how he came to Christ. It seems that he had a Christian friend whose life made a huge impact on him. Day after day he watched his friend, studying how he handled the problems of life, and listened as he openly declared his faith. Eventually the businessman said to himself, “I want what my friend has,” and he came to saving faith in Jesus Christ. Success comes in various forms. Some view it as the accumulation of great wealth gained through suffering and sacrifice. But for the believer, success comes only through doing God's will. A young man named John W. Yates was so poor that he had to put cardboard in his shoes to cover the holes. Yet when he opened a bank account at the age of fifteen, he deposited his meager earnings under the name "John W. Yates and Company," acknowledging God as his partner and manager. He carried that practice into his business. In time, he became a multimillionaire. Another young man, Oswald Chambers of Scotland, showed so much artistic promise that he was invited to study under Europe's greatest masters at age eighteen. But he declined the offer and enrolled in a little-known Bible school, where he eventually became a teacher. Later, he went to Egypt and ministered to the spiritual needs of British soldiers. Chambers died there when he was only in his forties, but he left to the world a rich legacy of devotional literature. Both men made doing God's will their prime objective; both achieved success. Oswald Chambers of Scotland showed so much artistic promise that he was invited to study under Europe's greatest masters at age eighteen. But he declined the offer and enrolled in a little-known Bible school, where he eventually became a teacher. Later, he went to Egypt and ministered to the spiritual needs of British soldiers. Chambers died there when he was only in his forties, but he left to the world a rich legacy of devotional literature. Let's summarize what "integrity" looks like in Daniel 6 (some of these characteristics overlap)..
(2) Da 6:3 - Extraordinary spirit ~ excellent attitude, an attitude that pervades everything we do. Integrity pursues excellence in all it does, whether someone is watching or not, whether anyone on this earth every knows or not. Men of integrity are God-pleasers not man-pleasers. Proverbs 15:3 says God's eyes are everywhere watching the evil and the good so God always knows and He will reward us for our labors performed with integrity at the Judgment Seat of Christ (2Co 5:10-note). (3) Da 6:4 Faithful = Trustworthy, Reliable. Integrity can always be counted on to follow through. Our words don't "outrun" our actions. Integrity practices what it preaches! (7) Da 6:10 Consistent, prevailing, prioritized prayer life - "As he had been doing previously." The man of integrity makes persistent prayer a priority not matter how busy he is with the everyday affairs of the world! (9) Da 6:16, 20 Integrity exhibits a consistent Christian life - The witness of Daniel to the pagan king was that Daniel was a "servant of the Living God" - the God Who you (Daniel) "constantly served"
(10) Da 6:21, 22, 23 The man of integrity is fearless and bold - Notice that when Daniel speaks in Da 6:22, 23 he is still in the Lion's Den -- and yet he is speaking calmly to Darius without any suggestion of fear of the lions. A clear conscience is a primary benefit of integrity, and it enables one to stand firm when the storms of life come upon us. If your heart does not condemn you, but affirms you, you can be a tower of strength for "The man of integrity walks securely." (Pr 10:9) Hebrew for "securely" (see word study - betach) means safety, security, place of refuge; feeling of trust, assurance, without concern, confidence. (12) Da 6:23 The man of integrity is a man of faith - He trusts in God. He walks by faith not sight - He glances at the Lions but he fixes his gaze on His Lord. (15) Da 6:28 The man of integrity will experience "success" - In this present life (sometimes he receives material success but always and more importantly he receives spiritual success) and in the life to come (Da 12:13). Integrity is inseparable from fruitful Christian ministry.